Hypnobabies not just for childbirth comfort? ragement, love and daily Hypno-reminders for our Hypnobabies students, and our Hypno-moms often comment on their experiences with Hypnobabies during their pregnancies. This helps other moms and birth professionals to understand that although Hypnobabies techniques create much easier, more comfortable births, they can also be used during pregnancy for a much more calm, comfortable, relaxed and enjoyable “waiting for baby” time. What an amazing gift they are giving themselves and their babies – yes, Hypnobabies really works! Deborah M.: Currently pregnant with my fourth baby, and this will be my third Hypnobabies birth! I really love Hypnobabies, and have had great success using the home study course with my past two births. I just wish I had it for my first baby! Just wanted to share that I got my course back from a friend last week (she had borrowed it for her birth), and I was amazed at how relaxed I INSTANTLY was when hearing the tracks for the first time in 4.5 years! I truly believe that anyone who does the daily practice and follows the program as written can have an amazing Hypnobabies birth. And listening to just one track made me so excited for this upcoming birth! Cortney A,: I just finished listening to my Hypnobabies Visualize Your Birth track for the first time. This is by far my favorite track. I just feel so peaceful and confident about my whole birthing time and I’m so excited to meet our sweet baby boy. I have had trouble staying awake with my other tracks but this one I was so engaged and in the moment. It was so beautiful I started crying when I followed along and my baby was placed on my chest. 36 weeks tomorrow and feeling so prepared! Marie G.: I woke up this morning with a terrible cramp in both calves, ready to scream out loud from the pain. Then I remembered my Hypnobabies tools and I put down my switch (Hypnobabies technique) and simply breathed through it. Instantly and like magic the cramping subsided. I could feel my legs still tensing up but I could not feel any discomfort whatsoever. Now that was an aha-moment for me! Margaret B.: I am 34 weeks along with my first baby and I’m doing the Hypnobabies home study course. I have a LOT of anxiety surrounding my prenatal appointments because recently I was told I was “high risk” after two blood pressure readings in the 130’s in-office. So I now have trouble sleeping the night before a prenatal appointment, dreading getting my BP taken. However, I am on week 3 of the Home Study Training and learning the Eyes Open hypnosis and the Center switch (Hypnobabies hypnosis techniques) setting. I have not missed a single hypno-practice assignment or Hypno-session track throughout this course. Today, I had my 34 week appointment. I woke up, did my hypnosis track for the day, and listened to my joyful pregnancy affirmations while I got ready to leave. At my last appointment, I felt extremely anxious beforehand and my BP was 142/89. ? When I got in the waiting room today, I listened to my Hypnobabies pregnancy affirmations again and practiced some hypnosis. In the exam room, I noticed how much more relaxed I felt, and when they took my BP I used my Hypnobabies peace hypnosis cue. I was shocked when the nurse said, “wow, that’s not too bad at all! 127/80.” I have never gotten it under 135 in their office this entire pregnancy, including my 8 week checkup!! I am so happy with this! It may sound small, but I’m so glad to know my hypnosis is working! Deborah M.: One of my absolute favorite things about Hypnobabies is the joyful pregnancy affirmations! This is my fourth baby, third hypnobaby, and with each pregnancy a different affirmation has stood out to me more than the others. This time it’s “pregnancy is natural, normal, healthy, and safe, for me and my baby.” I really connect with it more than any other this time! I really love Hypnobabies, and have had great success using the home study course with my past two births. I just wish I had it for my first baby! I got my course back from a friend last week (she had borrowed it for her birth), and I was amazed at how relaxed I INSTANTLY was when hearing the tracks for the first time in 4.5 years! I truly believe that anyone who does the daily practice and follows the program as written can have an amazing Hypnobabies birth. And listening to just one track made me so excited for this upcoming birth! Stephanie S.: I finished the full six week series of Hypnobabies a bit ago and have been on maintenance tracks now and my guess date (due date) is in a few weeks. I have experienced an unexpected perk from the process of learning Hypnobabies. Taking 30 to 50 minutes each day to listen to my hypnosis tracks and relax deeply has really helped me stay comfortable and well physically. It isn’t just my brain that gets a break, but my body too. That in and of itself has made this process worthwhile. My chiropractor has noticed too. He has seen me through 2 pregnancies, baby 1 is just 2. And he asked me what I was doing differently. When I told him about Hypnobabies, his response was keep doing that! It is working great. Arielle B.: Since my birthing time is getting closer I decided to test my hypno-anesthesia to see how well it works. I despise getting my blood drawn, yet, I need to have it taken 1x a month… Yesterday, I replaced biting hard on my finger, looking away and grunting with my hypno-anesthesia and it worked!!!! An amazing thing – the nurse completely messed up my arm and my vein became the size of a golf ball and still I stayed calm. After the blood draw my husband was like, “omg, did you see what she did to your vein, the needle was moving around like crazy!” It was so strange, I felt the needle but I was really able to think away any pain with my Hypnobabies techniques! Another Hypno-mom responded to Arielle: Christy H.: Awesome job using your hypno-tools!! This was my biggest motivation for seeking out Hypnobabies. I am terrified of needles. (Think grown woman crying and hyperventilating while her dad takes a splinter out with a sewing needle). Not only can I get blood drawn like a champ now, it’s amazing what fear can do to you when you face it! Laurel M.: I’ve been studying Hypnobabies for 9 weeks now, and my practice waves have literally started to feel GOOD. I can’t explain the feeling other than it’s pleasant and enjoyable. I very much looking forward to birthing time! Melissa O.: I’m in week two of my Hypnobabies program. Had my blood glucose test done this morning, used my hypnosis and barely noticed when the phlebotomist poked me! I’m usually very nervous with needles. Looking forward to continuing the program. It’s definitely helped as I’ve had preterm pressure waves as well and am on modified bed rest. Leah L.: I just wanted to say that I also enjoyed some amazing benefits of a less anxiety filled pregnancy and calmer postpartum with Hypnobabies, so the program isn’t just beneficial for birthing time. This was my second unmedicated birth, and even though my Hypnobabies birth was longer in duration, I was way more comfortable and well rested physically and emotionally!! I credit this to Hypnobabies. Lindsey K.: I used my Hypnobabies techniques for a “fix it” massage that usually has me crying, coming off the table and screaming. I’m only on week 4 of my Hypnobabies course, but decided to try using my finger-drop hypnosis technique. I was skeptical, but figured it couldn’t hurt. I felt the work being done, but was so relaxed that he was able to get deeper into the problem areas than usual, and I only felt pressure, no pain. It was amazing and now I have confidence in the program and my own ability to use it during my birthing time! Jessica J.: I loved my birthing and I’m not currently pregnant but I use my same Hypnobabies birth hypno-anesthesia techniques for my dental work, PAP smears, getting an IUD placed, I had cervical dysplasia/cancer and used it for all of my treatments for that! 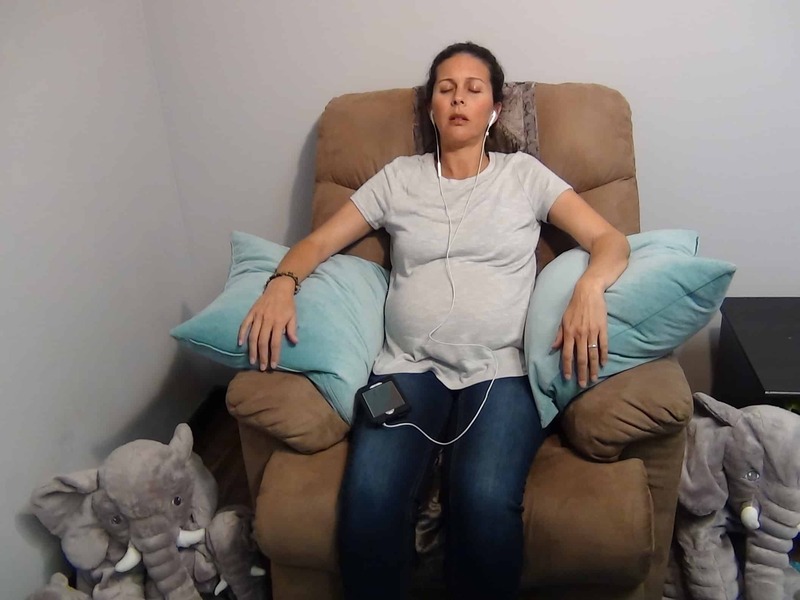 Maryann M.: I listen to my Joyful Pregnancy Affirmations pretty much every day and I’m listening to a hypnosis track every night before bed/as I fall asleep, I think I’m starting to get addicted to them as a way to relax before bed haha! I did have an instance the other week where I put my hypno-anesthesia to use… I woke up with an awful charlie horse and couldn’t get my muscle to release, I was in so much pain and then all the sudden I remembered “I have Hypnobabies tools for this” and used my hypno-peace cue and got immediate relief! It was awesome. Cristina B.: Just wanted to share a win. 40 weeks yesterday and I started to have intense cramping at night. I did my hypnosis tracks in bed and they helped ease my cramping quite a bit. I haven’t slept over the last few nights so I decided to see if my hypnosis could help me get some rest since I was so distracted with the cramps and baby moving like CRAZY. Lol. So I used one of my hypnosis induction cues and told myself that I’d fall asleep, and I also assured myself that when I woke up my mental lightswitch (Hypnobabies cue) would turn on and I’d feel amazing. Oh how I love Hypnobabies. I fell asleep with my lightswitch in center and had the best sleep I’ve had in weeks! Still woke up every 2-3 hrs yet my sleep in between was deep and I was comfortable. Yay!!! ? Regina M.: Hypnobabies – not just for your birthing time, but for your whole pregnancy! I just have to credit Hypnobabies for helping me enjoy this last pregnancy no matter what life throws at me. Some pretty ridiculous stuff happened on Friday at work and even bled into my personal time after work that evening. I spent the weekend dreading coming into work today and expected to not sleep much last night. Right before bed I put on my Visualize your Birth track. I was able to relax and focus on nothing but my baby and body and what is to come in the upcoming 5-8+ weeks. I went to bed laughing with my husband about my pregnant body and fell asleep so quickly and peacefully. I just love that this program gives you tools for your whole pregnancy, birthing time, and life. I’m so glad that God lead me to find Hypnobabies 2 years ago when pregnant with my second child and now I am enjoying this 3rd and last pregnancy to the fullest. Rachel W.: My Hypnobabies is seriously my favorite time of the day. I started earlier in my pregnancy than most moms do because I was concerned with not having enough time to fully prepare and now I’m 24 weeks and in maintenance (Full Hypnobabies practice). I often find myself excitedly waiting for my birthing time (labor) because I feel ready. But the relaxation when I listen to my hypnosis tracks is the best part of my day! I’m overly excited and confident about having my first hypnobaby. Erin H.: I just wanted to share with fellow hypno-moms that would understand my excitement… Last night I went to bed and was having some very uncomfortable back pain. I was finding it hard to sleep with the pain, so I decided to use my Hypnobabies finger-drop technique to enter hypnosis and send hypno-anesthesia to the spot where I was having the pain. I’m so happy to say that the pain went away after a few minutes and I was able to drift off to a very sound sleep. This really has given me such confidence that I will be able to use these techniques during my birthing time. Victoria P.: My Hypnobabies joyful pregnancy affirmations have helped me so much this time. I admit I didn’t really use them with my first two hypno-babies, I didn’t think I needed them. This time I have been in a very bad place mentally. Probably because of the summer heat and trying to take care of 4 other kids. I started listening to them daily and I have had 100% turn around in mood and energy! Kayla S.: I wanted to share that I used my Hypnobabies hypnosis today during the ECV procedure to flip my baby. They were able to flip him on the first try and using my mental hypno-lightswitch helped so much! The doctors and nurses were expressing how much it helped for me to stay so relaxed and breathe so well during the ECV. They were amazed! Lol it felt so good to use it in a real life situation! This gives me so much hope for the real deal – my baby’s birth! Hypno-mom K.: I was in the worst place with this pregnancy. I cursed and I cried when I found out. I wasn’t excited to tell anyone. I didn’t know how I would do it, having my two kids including an older one with special needs, and feeling terrified of birth again. I was depressed for months. Then I found Hypnobabies and I decided, why not, I had nothing to lose. I felt empty and lost. Hypnobabies has not only changed my entire attitude toward birth but it has given me joy in pregnancy and this baby when I thought all hope was lost. I could barely look at babies when I was first pregnant and now I’m watching Hypnobabies birth videos with joy and anticipation for my own baby. In the last month I was finally feeling excited enough to actually buy things for my baby and start making space in my home for her. The Hypnobabies tracks have helped me to feel connected to my baby and has helped me take care of myself and eat well and get in control of my anxiety. I haven’t even given birth yet but I’m already feeling in a much more relaxed and peaceful place. I’m relieved that I can celebrate my baby’s arrival like I’ve always wanted but didn’t feel like I could. Two months ago you’d never have known I was about to have a baby – our home was empty of baby things and I barely talked about it. Now I have started to decorate my family room where the baby will be born and get out some clothes and wraps and diapers for her too. Thank you Kerry Tuschhoff and thank you Hypnobabies. I’m so glad I am no longer suffering through this pregnancy! Amanda V.: I have to say… I couldn’t have chosen a program to better fit me. I’m only on Class 1, I already had my first successful hypnosis session yesterday after trying the first track, and everything I’m reading in my Hypnobabies workbook is a reaffirmation of what I’ve already learned from life experience. I feel like I am reading my own life story about learning strength and power over how you choose to think and feel, in reading this course. It feels pretty good to know that I have made a choice that clearly fits what I want and need in my life. No less, no more. Not sure what the point of posting this is.. Maybe there is someone out there debating on whether or not Hypnobabies would be a wise decision to invest in. Maybe there is someone already trying another “hypnobirthing” program and not seeing the results they had hoped for. My Hypnobabies workbook is so logical and loaded with what is real and accurate… I’m blessed having heard about this program. I am in week 32 of my pregnancy and am pleased with all the resources I have attained during this pregnancy. I ordered the home study course in order to have an easier birth, but I had no idea it would help me find joy in the actual pregnancy and the process. Thank you Kerry Tuschhoff, for all your work and knowledge and dedication! Brandi H.: I had a very traumatic first birth (non-Hypnobabies). I had counseling for two years, suffered PTSD and severe depression. I also have two angel babies which adds a whole other layer of doubt. I had no faith in my own body. My confidence BEFORE Hypnobabies was zero. I didn’t celebrate many early milestones with either of my rainbow babies. I instead kept waiting because I was secretly worried to celebrate them and jinx my success with the current pregnancy. I can tell you that Hypnobabies helped me heal what time, therapists, and psychologists could not. I worked through those fears and doubts. I could do that because I finally had tools to help me. I had tools like my hypnosis “bubble of peace” to block out negativity. I had tools to remove any lingering fears and then affirmations that replaced every negative with positive thoughts and feelings (Hypnobabies fear clearing sessions). I had someone walking me through every step. I could clearly visualize my upcoming birthing time and was prepared for anything… Including a change in plans. By my birthing time I was the most confident I had ever been in my own body. I was calm. I was prepared. I have never been as in touch with my own body as I was during those 14 hours of birthing time before my daughter was born. It was the most amazing, healing experience of my life. Jennifer L.: Hypnobabies made everything about my second pregnancy and birth soooo much easier & more enjoyable! What a gift! Kristine W.: I was terrified of childbirth and I kept hearing about Hypnobabies and after looking into it I realized this was for me! From the first moment I started practicing and after my first class I fell in love. Lindsay B.: I’ve had two Hypnobabies births. The biggest thing Hypnobabies did for me was encourage me to let go of fear. I did not have any fear of birth or my birthing time. I was completely confident as a first-time mom that things would happen as they should and I would be fine. I knew I could do it. I didn’t want any pain medicine and for both births, I never even considered it, even during some intense moments. Hypnobabies also encouraged me to be patient and trust the journey and timing of my baby. Pregnancy was not a glam process for me either time, but I never felt like I had to get my baby out of me. I enjoyed and continued life until my birthing time. And … I also have to share because I’m so excited – I feel the hormone relaxin releases super strongly in my jaw and last night I was having jaw pain and decided to use my Hypnobabies in hopes that it would help. Not only did it help during the hypnotracks but the anesthesia seemed to stick around for a little bit after as well! Then right before bed I did my finger drop to try to get rid of the pain again and it took away the pain completely so that I was able to sleep! I woke up this morning feeling confident in my Hypnobabies and without any more jaw pain! Hypnobabies completely changed my pregnancy! Thank you for this amazing program and class! Becca K: I am 22 weeks currently. and I have just started my Hypnobabies course. This week we are on class #2. I am really looking forward to having a hypnobaby. Just what I have studied so far, I am now so relaxed in the evenings I am getting much better sleep and able to complete more throughout the day. So much stress has been resolved. Looking forward to learning more!